Keele University recently became the first English university to allow students to apply for places using the US Common Application system. 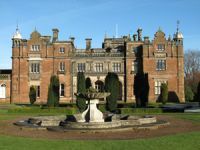 Keele, which was the founded in 1949, was the first new British university of the Twentieth Century. It is located in Newcastle-under-Lyme, Staffordshire. It is the largest main campus university in the UK and is ranked in the top 350 universities in the world by The Times Higher Education supplement. However, it is not a member of the elite Russell Group, which comprises twenty-four of the UK’s top universities, including Cambridge University and Oxford University. Keele’s adoption of the Common Application system Keele will allow students from the US to apply for places using the same form as they use to apply for US colleges such as Harvard, Yale or Princeton. They will no longer have to go through the UK’s Universities and Colleges Admissions Service (UCAS). Although Keele is the first university in England to adopt the Common Application system, it is not the first in the UK. The University of St Andrews in Scotland is already a member. St Andrews is an excellent university, which is perhaps best known for its proximity to the world-famous St Andrews golf course and its most famous former student, Prince William. International students are an important source of revenue for UK universities and Keele’s initiative is the just latest move by a British university to make itself more accessible to foreign students. The UK is currently the second most popular destination for students studying outside of their own country and is keen to strengthen its position. The USA is unsurprisingly the number one destination. UK universities are not alone in thinking about becoming part of other countries application systems. According to a report by the BBC, the University of Maastricht in the Netherlands is thinking about applying to become part of UCAS. In the future, it seems possible that all of the world’s major universities will be accessed through a single application system making movement of students internationally a much easier process.